The largest online shopping mall in the Philippines, Lazada, is once again mounting the biggest online sale of the year. Dubbed the Lazada Online Revolution: Shop the Universe, this most anticipated event is to kick off on Nov 9 with the Mega Sale to happen on November 9-11, 2017, and will run until December 12, 2017. How much discounts are up for grabs this time around? Up to 95% OFF on all of its items coming from major brands of different categories. That's on top of awesome deals and flash sales coming out all throughout the "revolution." 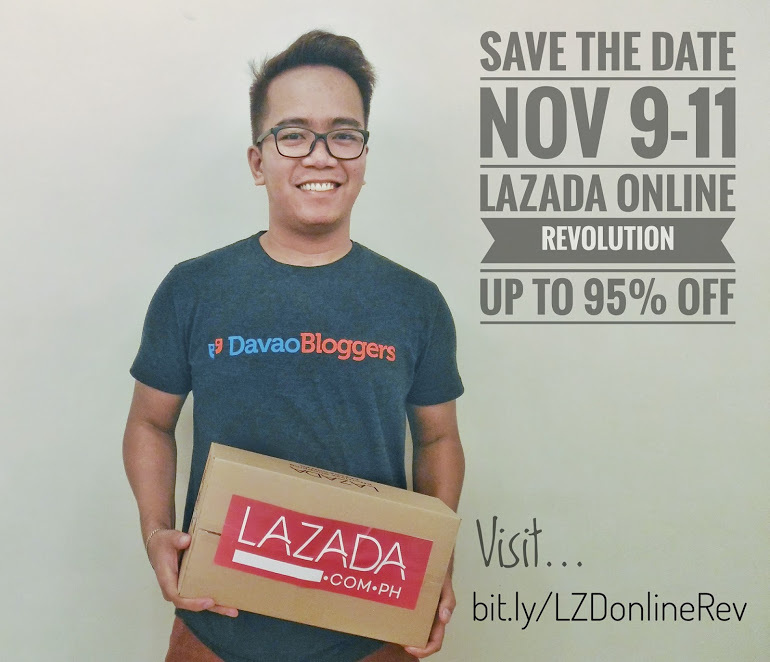 Last November 4th, Lazada Philippines went to Davao City and invited local bloggers, vloggers, and influencers to formally launch this year's Online Revolution campaign. You can follow hashtags #Nov9to11, #LazadaRevolution, and #ShopTheUniverse on Instagram and Facebook to have a look on what took place during the event. As expected and based from previous events from Lazada relating to this particular launch, it was all fun and full of exciting news that every Lazada customer will be happy to hear about and take advantage of during the whole run of the campaign for November and December. Customers like you and me can expect tons of treats, raffle promos, special offers and surprise sales promotions from Lazada's roster of partner brands as well as 11-PESO DEALS and flash sales all beginning to happen on November 9! A couple of weeks ago, Lazada Philippines added the Taobao collection to their already-massive online offerings. In case you are still not aware what Taobao is, it is one of the China-based companies owned by the Chinese eCommerce titan named Alibaba Group which also owns a controlling stake in Lazada of about 83%. Taobao, by itself, is also a giant of an online marketplace offering wide variety of items, about 760 million product listings as of 2013. See link above to have a peek of their offerings. If you have not placed order from Lazada website yet but interested in doing so especially during the Online Revolution period, you may want to check out for Quick Tutorial: How to Order from Lazada post I made. Ordering in Lazada is pretty easy and convenient actually. First of all, you do not need to create a Lazada account to order. Although there is an option to sign up, you can still check out as guest, just provide your email address, contact details, and shipping address and you are good to go. Additionally, Lazada offers Cash on Delivery option as payment method on almost all of its items even the ones coming from abroad. Also, there is FREE SHIPPING in all of Metro Manila and for a minimum purchase amount in other places.